On It's Time you notice that he cultivates a different way of playing on every song. Michael Jackson's Human Nature is one of the most performed in smooth jazz. Patrick sets own accents with his version. Forever is his further development of this topic. Patrick dissolves with Room 335 of the Smooth Jazz scheme and approaches other styles. Larry Carlton started his career with this song named after his studio. The introduction of Say Ow assumes the begin of a rock song, but quickly he changes direction. It's evident: Several hearts beat in his chest. Influenced by Eric Clapton Lay Me Down has that certain something. Patrick presents on More Than I Am a fascinating duet with a violin. Yandall also creates within his limited financial resources the maximum like on The Don. Patrick even withstands the direct comparison with Steely Dan on Josie. But the most he affects in his own smooth jazz creations such as Sir Mango. Also the funky attitude like Bump This will not fall short of expectations. A humming bird can't live unless it's free to fly, so Patrick gives the bird freedom with the atmospheric When Robins Fly. 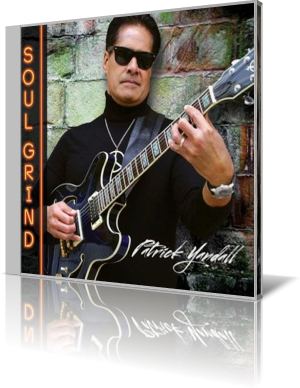 With Soul Grind Patrick sets new standards as a guitarist and composer. Fourteen songs or should I say fourteen arguments are speaking for themselves.